Get the unique sound, improved performance and gas mileage with this Borla Stainless Steel Cat-Back Exhaust System for the 2004 - 2007 Legacy GT. Borla Performance Industries has once again developed a unique performance exhaust for a Subaru. This time, the BORLA R&D Team has engineered a bold dual exhaust system for the Legacy GT Turbo (PN 140123). BORLA has made a big splash in the sports compact aftermarket with their stainless steel Header and Cat-Back� for the WRX, winning many performance shootouts. The new Legacy GT Turbo with the 2.4L 4-cylinder engine is a natural for the BORLA straight-through, free-breathing mufflers and smooth CNC mandrel bent high quality austenitic stainless steel exhaust pipes. This split rear system exits with large polished oval BORLA embossed rolled edge tips. BORLA testing reveals power increases that most likely are a direct correlation to the increased air flow the BORLA system exhibits. All this and 20% lighter than the stock system. A great performance exhaust with a powerful sound and the durability that has made BORLA famous. When you deal with the high exhaust temperatures of turbocharged engines, the aerospace-bred BORLA exhaust is like money in the bank. With credentials on the street and the track, it�s no accident so many serious performance enthusiasts choose Borla Performance Exhaust for their Subaru vehicles. 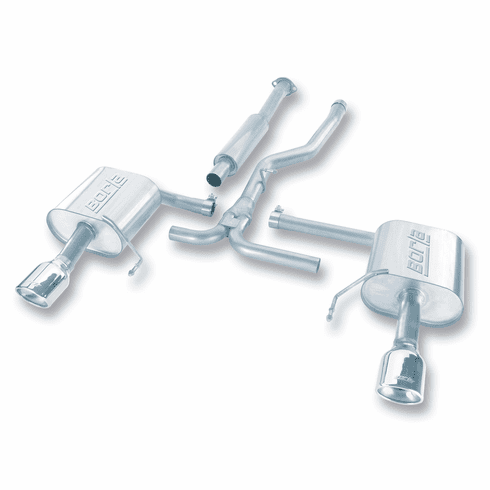 BORLA, the original pioneers of aircraft-grade high quality austenitic stainless steel (superior to T-409 or aluminized steel) free-flow exhaust utilizes its patented award and race winning technology to deliver quality, sound, performance gains and enhanced fuel economy � all with an easy bolt-on installation. All BORLA street products carry the famous BORLA written million-mile warranty.